The jaw-dropping Gulf Craft Majesty 155! 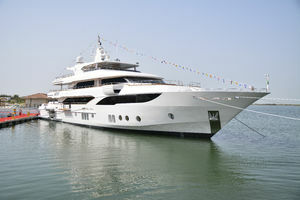 Three towers of success is a premise that keeps the Gulf Craft shipyard a prizewinner around the globe. The prosperous towers include cherishing of the sea, diligent and perpetual productivity and a zeal for manufacturing. The company was founded in 1982 and has continued to considerably develop ever since. Their overall delivery is more than 9000 vessels to date! 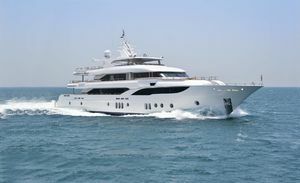 The strategic location of the Gulf Craft Company certainly helps since they are near the nautical market of Europe, and yet at the threshold of the fast-growing Asian market. The expertise of their personnel, proficient craftsmanship, and extraordinary quality has led to the point where every harbor in the world welcomes their vessels. 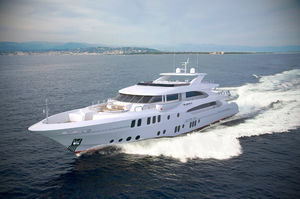 Their whole-hearted enthusiasm can be felt in each and every yacht they make, and that’s the case with the Majesty 155. 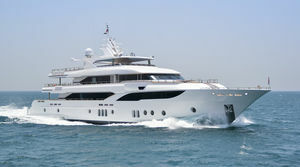 The Majesty 155 is the most monumental yacht that was completely manufactured in the Middle East. The vessel exemplifies a totally new dimension of engineering and technological advancement. With this design, the company has set sail with more serious and contemplative projects in the market. This breathtaking yacht was unveiled during the Monaco Yacht Show in 2013 portraying both the inside and outside perks of the yacht. 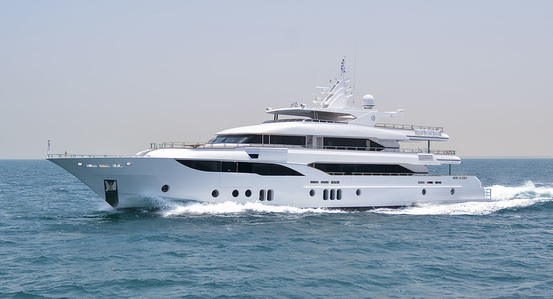 Erwin Bamps, CEO of Gulf Craft said: "We understand that our customers have a genuine appreciation for opulence, and would like to experience the same lavish lifestyle and entertainment on the water that they do on land. The Majesty 155 was crafted to provide a truly deluxe experience that has never before been available from Gulf Craft, as we continue our drive to gain market share." She is a tribute to a diversity of Arabian cultures. Henceforth, experienced and talented personnel from Emiratis, Iraq, Iran, Palestine and Syria have all contributed to the ingenuity of the vessel. 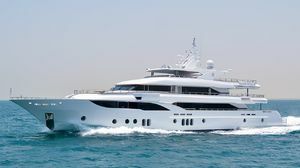 Let us dive into the Majesty 155 review and set sail on a genuine yacht with a subtle Arabic feel. 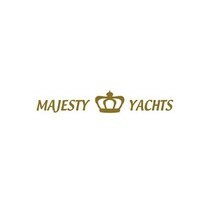 The overall length of the Majesty 155 is 154 feet and 5 inches and a beam is 31 feet and 5 inches. 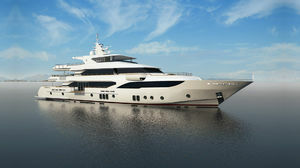 The latest hull has significantly changed in comparison with the previous models. The long-established multi-port holes are in the past. A sleek rake of dark tinted glazing carves a dash side to side through the displacement hull which was designed by Massimo Gregori Grgič of Yankee Delta Studio. It is made of glass fiber reinforced plastics which have tremendous mechanical strength. Further, it is resistant to corrosion and temperature. The weight is really light; the surface is smooth and easy to repair. The hull design was used for long range cruising. This means that the Majesty 155 can cruise at a speed of 10 knots ranging 4.200 nautical miles, simultaneously reducing fuel consumption at a minimum. 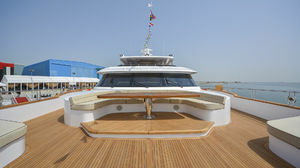 For the sake of the properly designed beam, the vessel possesses great stability and greater comfort during the ride. 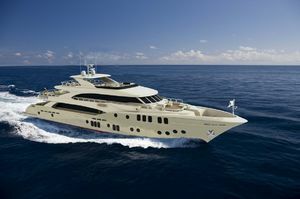 Naturally, the speed is not the main trait of the yacht; she is equipped with twin 2011 horsepower MTU 12 V 4000 M63 engines that offer a speed of 16 knots. Starting from the stern of the Majesty 155, one would expect an ordinary garage with standard features and equipment, yet this area symbolizes the opulent perks that the yacht is nicely composed of. Thus, this area called the "beach club" is brought to light via opening the transom door with a press of a button. This area is furnished through and through with wonderful white upholstered settees and a deck chair. The stern control unit has a joystick and throttle controls for additional maneuvering when necessary. The cockpit can be accessed via steps both to port and starboard. The magnificence of the cockpit is reflected through the entertainment features which include two circular tables embellished with intricate, teak mosaic. After sunset, the whole area is flooded with LED lights offering a romantic atmosphere during the night ride. An automatic glass sliding door marks the boundary between the cockpit and the main saloon. An elegant table is placed in the center of the saloon and is encompassed by two two settees and two-three settees. 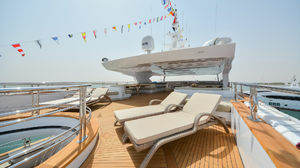 Since extensive windows are both to port and starboard, one can swivel the settees and enjoy the panoramic views. 3D relief wall panels add bells and whistles to this area. 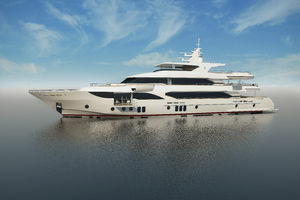 If one slides the starboard door and steps onto the deck, he can electrically lower the balcony which is a unique design offered by the Majesty 155. Furthermore, amazing glass pillars and the retractable 55" TV add a nice touch to the opulent atmosphere. A wonderful dining table can accommodate 12 people. 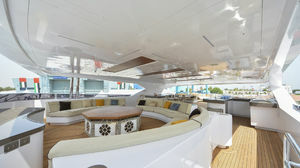 The proximity of the dining table to the galley is additional to the design of the Majesty 155. The galley itself exhibits generous proportions and is furnished with a severe amount of equipment, yet unnecessary fittings have been removed to avoid superfluous clutter. The center of the galley is occupied with a counter. The galley has a Teppanyaki grill, BBQ, refrigerator, coffee machine, steam oven, icemaker and so forth. All the way forward, the smoking room and then the owner’s stateroom are located. The smoking room is an appealing area where people can relax with their cigars; enjoy the scenery of a painting where a leafless tree has been depicted or a large flat TV screen. 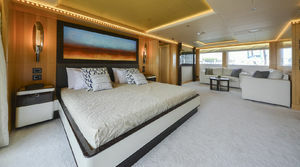 Full beam layout is what characterizes the owner’s stateroom. The main asset of this area is without a doubt the drop down balcony. With a table and chairs, it is a perfect spot for breakfast. In addition, the stateroom has a circular table, sofas, and a king size bed. The owner’s en-suite contains a huge whirlpool bath. Artistic depictions play, yet again, a major role in the demeanor of the areas dressing them up elegantly. The upper deck’s wheelhouse is an area where behind the two captain’s chairs, a settee with a table containing upholders is situated. The dashboard is well-equipped with advanced technology with various gauges, two large navigation displays, switches and so forth included in the panel. 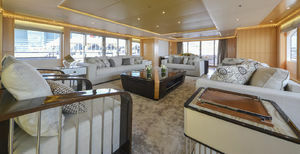 The upper deck also has a luxurious lounge with a bar and another galley. Completely aft on the upper deck, an enormous hot tub is installed. It’s a dreamboat, there is no doubt about it. 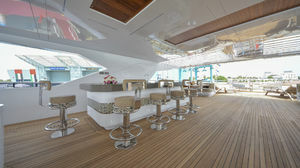 The flybridge is furnished with numerous settees, tables and a bar with a sink. 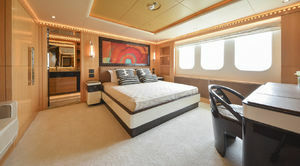 Below deck, both double guest staterooms to port and starboard have a separate double guest en suite. Both areas are equipped with a large flat TV screen, a wardrobe, several windows and a desk and chair. 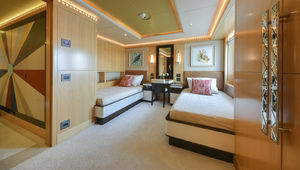 Moving forward, the twin guest staterooms are located to port and to starboard with their en suites. Completely forward are the crew quarters. The Majesty 155's layout is definitely something to be talked about and admired. Gulf Craft's Majesty 155 is a temptation due to her plentiful virtues regarding the hull, performance, layout, and design. To mention all the traits of this vessel, one would need a lot of time. What are you waiting for? Stop admiring and start inquiring! Contact us now for more information. 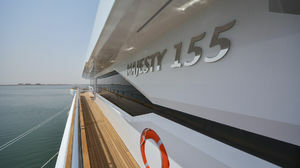 Enjoy life with the Majesty 155!